If you are a fan of TVF qtiyapa just like me, and wanted to watch their Box office release Sulemani Keeda, but you missed the movie because of releasing in selected theatres. Then, for the people like you and me, TVF started TVF Inbox Office, you can watch the awesome movies, which were not so famous, but are really good interms of content. The first movie which they are releasing is Sulemani Keeda, not only movie, you will also get 100 Rs freecharge credit value in 99 Rs. So, it's a great deal, i mean you don't need to pay anything for the movie. Do payment by Debit, Credit card or Net banking, International payment mode are also available. 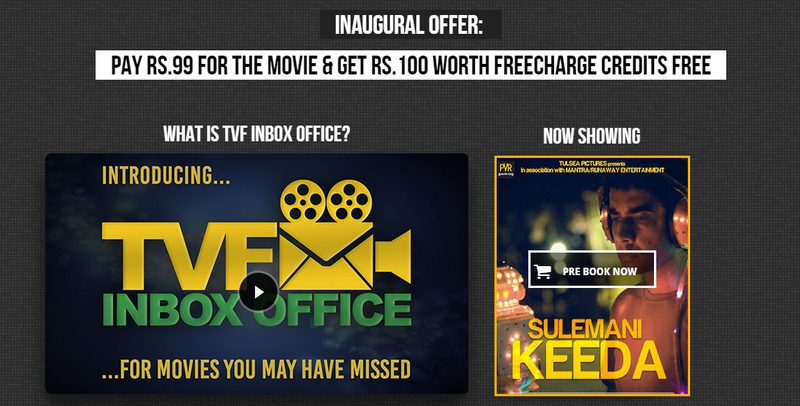 Now, you will avail Sulemani Keeda ticket of Online Box office, plus a 100 Rs Recharge Value from Freecharge. This offer is available only for Limited Time, so, Hurry! For more Daily Updates about Free Offers and Discount Coupons, Subscribe all india coupons via email.